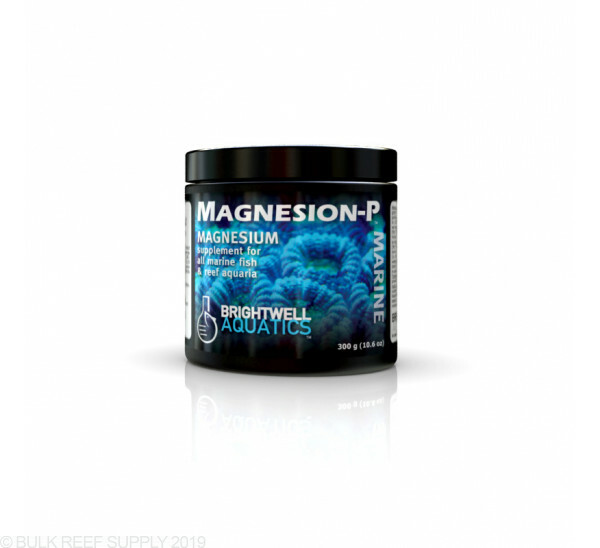 Provides magnesium, which helps regulate the balance between calcium and carbonates in aquarium water, and is a component of aragonite, the mineral secreted by reef-building organisms to form skeletal material. Stronger and more economical than liquid magnesium solutions; created for hobbyists maintaining multiple reef aquaria. Dissolve 2.5 grams (~½ teaspoon) of product per 20 US-gallons of aquarium water in 8-fl. oz. of fresh water; add every other day or as needed to maintain the magnesium concentration within a range of 1,290 - 1,320 ppm. When used in this fashion, 1,200 g treats up to 9,600 US-gallons (36,340 L). Create a stock solution by dissolving 20 grams (~4 teaspoons) of Magnesion-P in 8-fl. oz. of fresh water (preferably purified); each ml of the solution will increase magnesium concentration (”[Mg2+]”) in 1 US-gallon (3.785 L) of water by 6.0 ppm. [Reference: Each g of Magnesion-P will increase the [Mg2+] in 1 US-gallon (3.785 L) of water by 114.4 ppm.] If initial [Mg2+] in the aquarium is below 1,288 ppm, add stock sol’n at maximum rate of 10 ml per 20 US-gallons daily until desired [Mg2+] is attained, then dose daily or weekly as needed (see below). Maintain [Mg2+] within a range of +/-10 ppm. Once desired [Mg2+] has been acquired, measure aquarium's [Mg2+] at the same time each day over a one- to two-week period to determine the daily rate of magnesium uptake (i.e. the decrease in magnesium). To determine daily dosing rate (preferable to weekly dosing): estimate volume of water in entire aquarium system (US-gal. ); divide the daily decrease in [Mg2+] by 6.0; multiply this number by volume of water in system to obtain daily ml of stock sol’n required to maintain stable [Mg2+]. 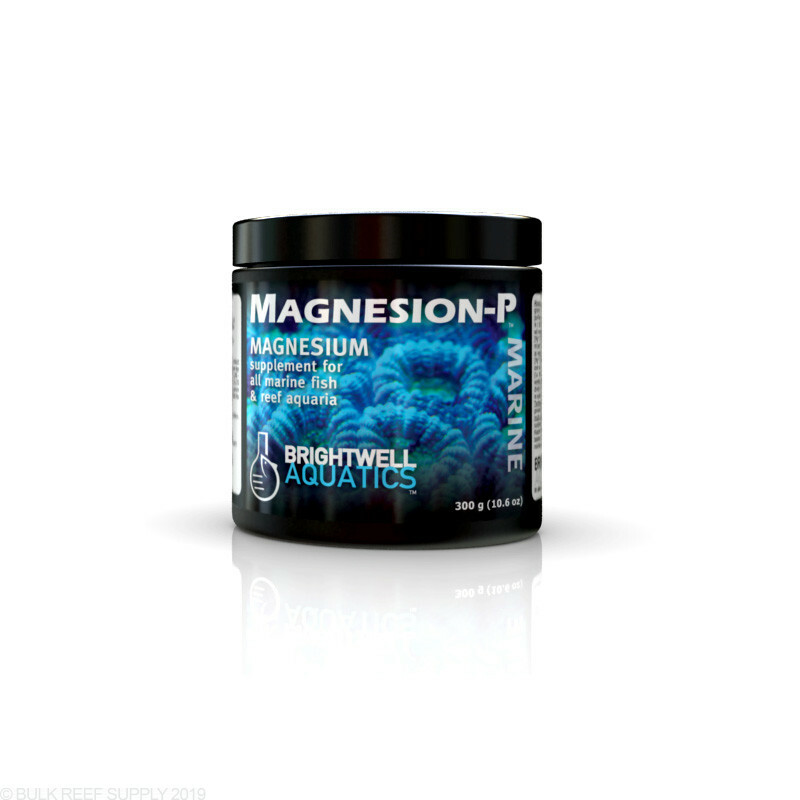 I have used various magnesium supplements and this one by far is the easiest and best to use. When I have to supplement my tank after a water change, all I do is perform the basic calculation for adding this product to you tank. The calculation Is directly from the products label and it is as follows: Amount (grams) of product = Amount to raise (in ppm) X tank volume (gallons) / 64. Remember NOT to raise the magnesium level more than 100 ppm per day. It really doesn’t matter how much FRESH R/O water you use, as long as all the powder completely dissolves. What matter is how much Mag P you use. According to Jack Kent, Brightwell is trying to get away from making “stock solutions” and it is far better and more straightforward to add the amount of powder you need with enough water to dissolve it in. I’ve been using this product for a long time and it really works and I recommend anyone that has problems maintaining their mg levels to try it. As magnesium goes I find this product consistent to meet the MG needs of my aquarium. I've used it for several years and am always on the lookout for better consistency and price; Mag-P fills the current needs with a high quality product that comes to clear when mixed with RO water.